Happy Friday, everyone! Over the years, a lot of you guys have asked about my messy buns, so I’m really excited to bring you a tutorial today! We photographed this post while we were in Mexico, and we actually took this Instagram afterwards! 🙂 As you know I’ve been using Schwarzkopf Gliss™hair products so I wanted to show you how I incorporate them into my hair routine as well! Step One: I’ve been using Gliss Ultra Moisture Shampoo and Conditioner to wash my hair, but the key to the messy bun is actually not to wash it right before you want to wear this hairstyle! It works better when your hair is a little dirty, because there’s more traction and the bun stays in place better. 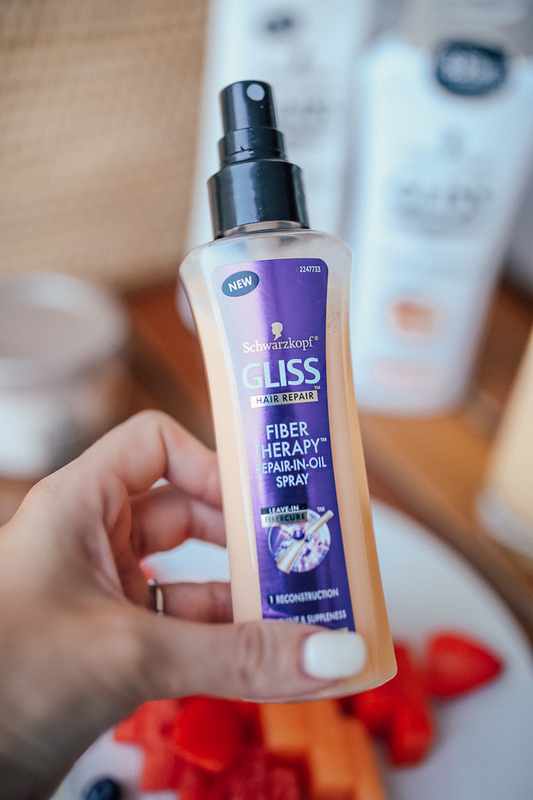 The only product I use before putting my hair in a bun is Gliss Fiber Therapy Repair-Leave In-Oil Spray. This product works triple duty because it makes my hair really shiny, helps my bun hold better and deep conditions my hair all at the same time. Step Two: Put your hair in a high ponytail with a small elastic band. I like to use a hair band that’s the same color as my hair so that it’s not visible at all. Step Three: Next I take my ponytail and twist it loosely (see above photos!). Once it’s twisted, I wrap it around itself to create a circle, tucking in the ends of my hair underneath the bun. Using a couple of bobby pins, I secure the bun in place (I use one bobby pin to secure the ends and the other on the opposite side of the bun). You can always use more bobby pins if you want it to feel a little more secure! Step Four: The final step is that I make it look a little bit “messier” by pulling on the bun. This also makes it a little bigger and I LOVE big buns, hehe! P.S. 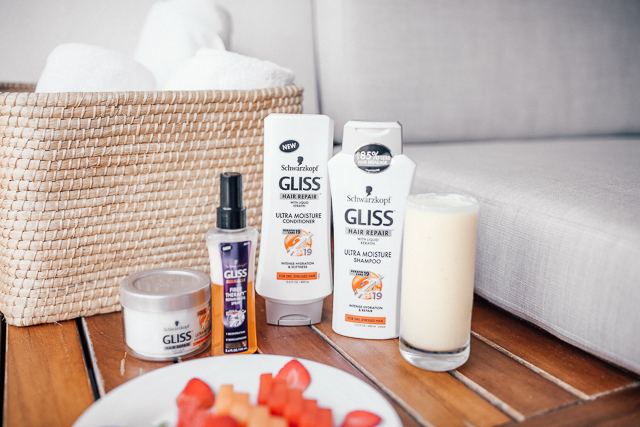 If you want to try out Gliss products, now is the time! Get a 30% off coupon on Gliss Hair Repair Ultimate Repair Shampoo & Conditioner and these four shampoo & conditioner sets. Let me know if you have any questions and HAPPY WEEKEND!! For those of you inquiring about Prince George he is doing MUCH better and acting like his normal self (and begging for his treats hahah!). Such a cute and simple tutorial! Lovely! So cute! I can't wait for my hair to grow out longer so I can do buns like this again! You always do a great job with your bun! Thanks for the tutorial! And I really need to try GLISS products! Those pjs are so cute! Always love a messy bun! Hi Caitlin! I love how elegant and simple your gold necklace is. Where did you get it? Your hair is always perfect, gliss looks and sounds great! Thanks for this tutorial. I'm going to have to give it a try. Have a great weekend. messy buns are always the best! Love this tutorial! Your messy bun is adorable! This was such a cute tutorial. You look amazing with your hair in a bun. Loving that floral pajama set!!!! This is the best messy updo on the internet, and I have been looking at hairdos for YEARS. 🙂 Thank you so much for sharing.